Washington, DC � Three new objects locked into roughly the same orbit as Neptune--called "Trojan" asteroids--have been found by researchers from the Carnegie Institution's Department of Terrestrial Magnetism (DTM) and the Gemini Observatory in Hilo, Hawaii. The discovery offers evidence that Neptune, much like its big cousin Jupiter, hosts thick clouds of Trojans in its orbit, and that these asteroids probably share a common source. It also brings the total of known Neptune Trojans to four. "It is exciting to have quadrupled the known population of Neptune Trojans," said Carnegie Hubble Fellow Scott Sheppard, lead author of the study, which appears in the June 15 online issue of Science Express. "In the process, we have learned a lot both about how these asteroids become locked into their stable orbits, as well as what they might be made of, which makes the discovery especially rewarding." The recently discovered Neptune Trojans are only the fourth stable group of asteroids observed around the Sun. The others are the Kuiper Belt just beyond Neptune, the Jupiter Trojans, and the main asteroid belt between Mars and Jupiter. Evidence suggests that the Neptune Trojans are more numerous than either the main asteroid belt or the Jupiter Trojans, but they are hard to observe because they are so far away from the Sun. Astronomers therefore require the largest telescopes in the world equipped with sensitive digital cameras to detect them. Trojan asteroids cluster around one of two points that lead or trail the planet by about 60 degrees in its orbit, known as Lagrangian points. In these areas, the gravitational pull of the planet and the Sun combine to lock the asteroids into stable orbits synchronized with the planet. German Astronomer Max Wolf identified the first Jupiter Trojan in 1906, and since then, more than 1800 such asteroids have been identified marching along that planet's orbit. Because Trojan asteroids share a planet's orbit, they can help astronomers understand how planets form, and how the solar system evolved. Researchers theorized that Trojans might also flank other planets, but evidence for this has surfaced only recently. In 2001, the first Neptune Trojan was spotted in the planet's leading Lagrangian point. In 2004, Sheppard and Chadwick Trujillo of the Gemini Observatory, who is also an author on the current study, found the second Neptune Trojan using Carnegie's Magellan-Baade 6.5 meter telescope in Las Campanas, Chile. They found two more in 2005, bringing the total to four, and observed them again using the 8.2 meter Gemini Telescope in Hawaii in order to accurately determine their orbits. 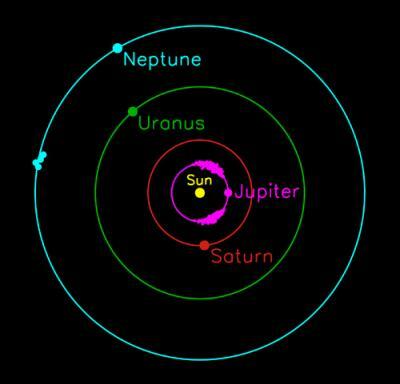 All four of the known Neptune Trojans reside in the planet's leading Lagrangian point. One of the new Trojans has an orbit that is more steeply tilted to the plane of the solar system than the other three. Although only this one has such a steep orbit, the methods used to observe the asteroids are not sensitive to objects so far out of tilt with the rest of the solar system. The very existence of this Trojan suggests that there are many more like it, and that Neptune's Trojans as a whole occupy thick clouds with complex, interlaced orbits. "We were really surprised to find a Neptune Trojan with such a large orbital inclination," Trujillo said. "The discovery of the one tilted Neptune Trojan implies that there may be many more far from the solar system plane than near the plane, and that the Trojans are really a "cloud" or "swarm" of objects co-orbiting with Neptune." A large population of high-inclination Neptune Trojans would rule out the possibility that they are left over from early in the solar system's history, since unaltered primordial asteroid groups should be closely aligned with the plane of the solar system. These clouds probably formed much like Jupiter's Trojan clouds did: once the giant planets settled into their paths around the Sun, any asteroid that happened to be in the Trojan region "froze" into its orbit. Sheppard and Trujillo also compared, for the first time, the colors of all four known Neptune Trojans. They are all about the same shade of pale red, suggesting that they share a similar origin and history. Though it is hard to tell for sure with only four on the books, the researchers believe that the Neptune Trojans might share a common origin with the Jupiter Trojans and outer irregular satellites of the giant planets. These objects might be the last remnants of the countless small bodies that formed in the giant planet region, most of which eventually became part of the planets or were tossed out of the solar system. This paper includes data gathered with the Carnegie 6.5 meter Magellan Telescopes located at Las Campanas Observatory, Chile, and is based in part on observations obtained at the Gemini Observatory in Hilo, Hawaii. Funding for the work was provided by NASA and the Gemini partnership, which includes: the National Science Foundation (United States), the Particle Physics and Astronomy Research Council (United Kingdom), the 8 National Research Council (Canada), CONICYT (Chile), the Australian Research Council (Australia), CNPq (Brazil) and CONICET (Argentina).